In my weekly menu planning posts I talk a lot (a whole lot) about the “freezer stash” that saves my bacon — ha ha — when I’m too tired or the hours in the day are running by just a little too fast. Somewhere along the way I promised to write about some of my tried and true freezer filling techniques. I’m here today to begin delivering on said promise by sharing the sheer brilliance that is macaroni and cheese cupcakes. I wish I could take credit for this idea, but alas I’m just not that creative. I am really great at finding and curating great ideas though so that has to count for something. I discovered this nifty trick via my latest obsession, Pinterest, and it’s not surprising that it’s a Once a Month Mom technique. It’s so simple but I suppose the best ones always are. Make a big batch of your favorite from-scratch macaroni and cheese recipe. Our house standard is the recipe from Beecher’s Cheese Shop in Seattle. I make a single batch of their Flagship cheese sauce and a double batch of the mac and cheese. I can’t always get Beecher’s cheeses here in Austin so I’ll substitute a good quality sharp cheddar and regular Monterey Jack cheese. I tend to get about 36 muffins in a batch and I use small elbow or shell noodles because they fit better in the muffin-size servings. 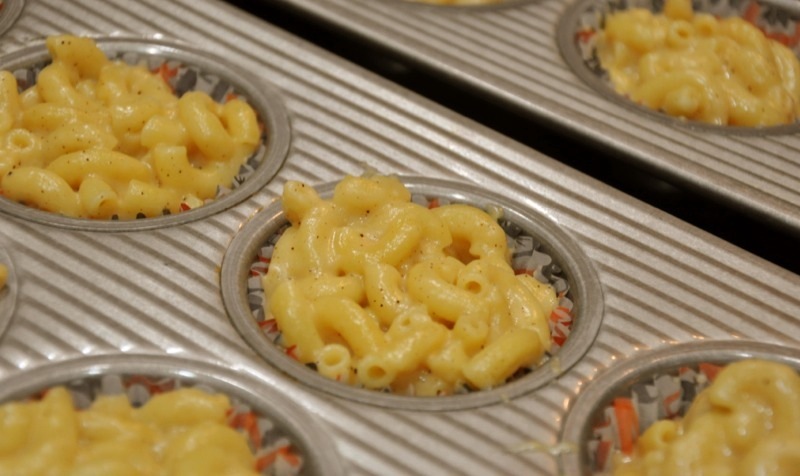 Dish the mac and cheese into lined muffin tins. The liners help the muffins release later and I use fun seasonal wrappers because well, they’re just plain fun. Bake the macaroni and cheese according to the recipe directions. When the muffins are finished take the tins out of the oven and let them cool a bit on the kitchen counter. Transfer the muffin tins to the freezer and freeze until the muffins are completely frozen then remove the muffins from the tin. If the muffins are stubborn and stick to the tin, run a bit of warm water over the bottom of the tin and they will pop right out. Store the muffins in zip-top freezer bags for up to 3 months. Reheat each muffin in the microwave for 30 – 60 seconds. One last word on why I love this idea: I’m a big fan of macaroni and cheese but of course when it’s made right it’s full of fat, carbs, and calories. These individual servings come with portion-control built in so I can treat myself from time to time. I take one muffin with me to work to have with a big salad for a fun indulgence. Because even grown-ups need a special treat now and again. I do freeze and store them in the liners. I take the muffin tin out of the oven and let it cool a bit then I stick the whole thing in my freezer, usually on a cookie sheet for stability. When the “muffins” are frozen, I remove them from the tin (sometimes I have to run a little water over the bottom to loosen them), and transfer them to a freezer storage bag. When I’m ready to reheat I put them right into the microwave. Thanks for the link up! We’re happy they’re a favorite!